Paintin-Patti: Happy Birthday to Me! Wishing you a very blessed birthday, Patti! Celebrations abound. Darling pictures of your decorations and your beautiful grandchildren. Oh Happy, happy birthday pretty lady! You even sound happy when you write........yay for you! Have a wondrous birthday. Happy birthday, Patti! It sounds like you have settled in a beautiful spot, (surrounded by farm fields and pony's) and all your hard work is turning it into the home of your dreams. You have beautiful grands! 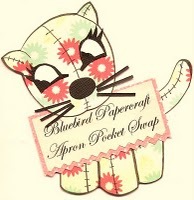 I love the cute little bluebird tea towel you have hanging from the green cabinet. Sounds like a wonderful life and home. Love all the pictures. Can't wait to see the garden fence. Have a Happy, Happy Birthday! Happy Happy Birthday! I enjoyed all your cheery photos. The little birdies are just adorable. Your property sounds just idyllic! Happy Birthday! Looking at the posted pictures one can tell a visitor would immediately feel comfortable in your home. I love the thought of your 'neighhhhbors (sorry couldn't help myself)stopping by to say hello to McKenzie. And the mountains in the background make me feel like bursting into patriotic song. Your appreciation of you what God has given you is a lesson to us all. I always feel a little bit better about myself and life in general after I visit you here at your blog. Happy Birthday again, and may the coming year be full of blessings. Hi Patti! I wish you a happy, fun, blessed Birthday and many more to follow! Your grandkids are sweet :) The eggs that Michele and I decorated are about 4-5 inches.